There are 2 competitions south before Christmas, one for juniors and one for seniors, which the Club can organise as a group trip away if there are enough interested. The trips only really work if there are enough numbers to make up a group and this keeps costs down. For this reason please let me know as soon as possible if you want to go or ask about the trips. There is also a fun competition just before Christmas to be held in Brae. This will be open to all our fencers from beginners onwards. Please look at the details below and get in touch as soon as possible, if interested. I can then have a chat over details etc. I will need to know very soon to maximise cost savings on transport and accom etc. 1. Junior 24 Epee, Linlithgow, Saturday 3rdNovember. This is for under 15’s and is organized by the same team that arranges the Age Group Series we take part in each June. This is designed to offer the most amount of fencing in a day, and, although a competition, the competitive side is balanced with giving everyone plenty of fencing at their own level. It is great format to gain experience and confidence. 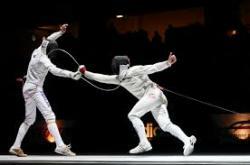 The competition takes part all day Saturday and the Wallace Club has offered to organise some fencing for the Friday. Travel is down on the Thursday night boat, Nov 1st returning on the Sunday night boat, Nov 4th. We stay at the Premier Inn, Edinburgh Park, travelling down by train. Cost: Can vary depending on size of group, and Northlink sponsorship, but we have charged £120 for all boat, train and accommodation for the past few years now and we try to keep down to that. Each fencer must enter online, the cost being £15. To view the event website, follow the link here, and follow links for November 3rdjunior epee 24er. 2. M8 Senior Open, Bathgate, near Edinburgh, Nov 10/11th. Cost: Can vary depending on size of group, and Northlink sponsorship, but we have charged £120 for all boat, train and accommodation for the past few years now and we try to keep close to that. To view event and enter online, go to this link and navigate through to events in November and M8. Before you enter, check with me on numbers ‘signed up’ for the trip as it will only be cost effective to go as a club trip if we have enough to keep costs down on travel and accom. etc. Fun Competition, Brae School Games Hall, Saturday December 15thfrom 10 till 2. There will be a fun competition held just before Christmas, at Brae, where we hold our Saturday Club sessions. The idea is for all our fencers, whatever weekly sessions they do to come along and take part. Format will depend on numbers and all are welcome from beginners to adults. Last year, we had a successful day at Aith, despite the snow and the more the merrier. Let me know if you can make it. If we hear from enough folk that the 15this a problem the weekend before is an option so let me know. We will be ‘signing up’ definite numbers nearer the time. All these dates and the info will be up on the calendar and news or events sections in the website so keep an eye on that.